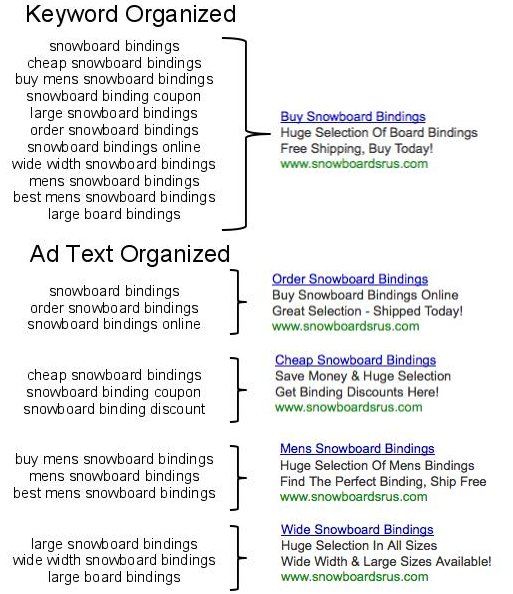 Ad text should guide the organization of ad groups and account structure, not keywords. Traditionally, people start their account structure by organizing their keywords into themes and then the keyword themes get placed into ad groups. At the very end they try to write ad copy for each ad group that will try to be relevant to all of the search queries that get matched to those keywords in the ad groups. But too often the keywords vary too much and you’re forced to either write generic ad copy that appeals to all of the keywords, or write targeted copy that is well-suited to some queries and poorly-suited to others. They call them ad groups and not keywords groups because its the ads that should guide the structure, not the keywords. This means that generally the amount of keywords in an ad group is small because any single text ad needs to be relevant for every keyword in that ad group.